This symmetrical, 1½-storey, gable-on-hip-roofed house has bellcast, hip-roofed extensions on either side towards the rear. The gables have turned finials. On either side of the centrally-located open porch are wide, shallow box bays, each with a bellcast, hipped roof. The shallow-hip-roofed porch has three chamfered square posts on each corner which are connected by heavy brackets supporting wide, flat arches below the frieze. The front gable has half-timbering on cedar shingles, the body of the house and the porch balustrade are clad in drop siding, the stair balustrade has vertical V-joint T&G. The house was raised and moved forward, a new brick foundation was laid and the brick chimneys were rebuilt. A pair of old walnut trees in front are outstanding. An elaborate cast metal fence has replaced the period picket fence. This was one of Samuel Maclure’s earliest works in Victoria. 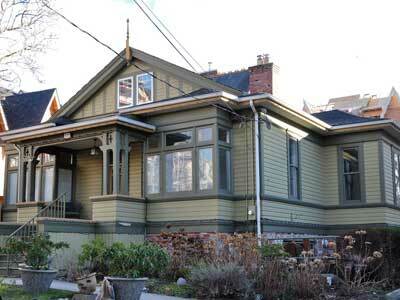 In 1889 improvements on this property for $300 were made by J.S. Helmcken (638 Elliot St, James Bay), but the present house was built in 1897. 1897-1990s: Robert John Porter’s (b. Saanich 1867-1922) parents Robert John Sr. and Alice came to Victoria in 1852 and 1865 respectively. Robert was born on the family’s cattle farm, later known as Woodwyn Farm, in Saanich. The family then moved to Burnside Rd; Robert and his siblings attended Craigflower Schoolhouse (2755 Admirals Rd, Saanich). His father established a meat market in Victoria in 1871; it became known as Robert Porter & Sons when the sons entered the partnership in 1886. The business had contracts to supply meat to many organizations, including the army, government and schools. In 1898 Robert married Flora Beaton (b. Lachute, QC 1876-1961), and they moved into this house. Flora came to BC in 1888, and here in 1898. In 1909 Robert Porter & Sons was sold to Patrick Burns of Calgary, and the ranch was leased to dairy farmers E. & T. Raper until 1950, when the Porter family sold the farm. Robert turned to municipal politics, and by 1912 he was a Victoria city alderman. As mayor of Victoria from 1919-21, Robert worked to overcome many of the city’s financial difficulties. He was part of a delegation to Ottawa which fought to keep wooden-ship building contracts on the West Coast. He was influential in the construction of the Sooke Waterworks for the city. During his last year as mayor, work on the Johnson St Bridge finally began after years of planning and delays. He had a continuing interest in agriculture, with many years of service as a director and later president of the BC Agricultural Association. Robert died unexpectedly of pneumonia. Porter Park on Fairfield Rd near Sir James Douglas School was named in his honour. Six Porter children grew up in this house, and several lived here most of their lives. Kathleen Alice (1898-1956), a dental nurse, married Daniel Prentice in 1930. Gertrude “Trudy” Gladys (1899-1993) a teacher, taught in Sooke and BC’s interior before retiring and returning home. She lived in this house until the early 1990s, then moved next door to Beacon Hill Villa (641 Superior St), where she died. Robert Beaton (1900-1980) was a pressman with the Daily Colonist and still lived here in 1955. He married Dorothy Ellene Jeeves and lived on Fairfield Rd at the time of his death. Florence Beatrice (1904-1990) married Andrew Lyton Alexander (b.1895-?) in 1933 and moved to Fairfield Rd. Iona Charlotte (1906-1985) worked in the family business from a young age, first as a stenographer in the 1920s-30s. She became a trustee and then secretary of the financial corporation of Robert Porter & Son until her retirement. She lived in the house until her death. Margaret “Jean” (1910-1953), educated at McGill University, worked for the Victoria Public Library from 1930-52 where she became head of circulation. She lived in the house until her death from cancer at 42.